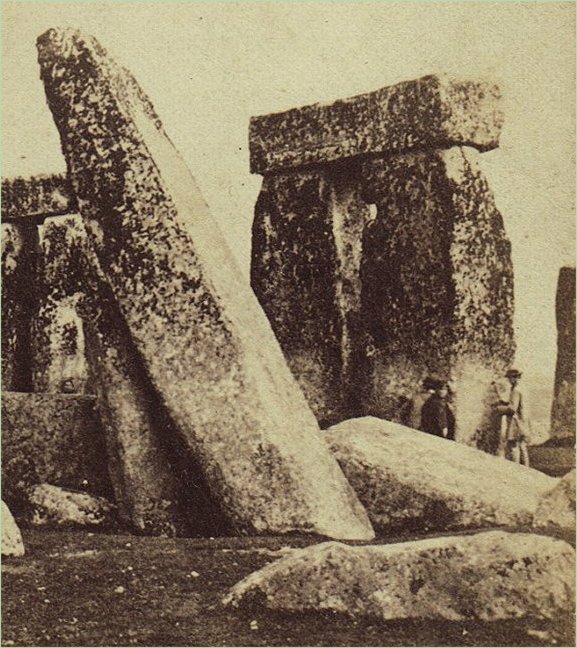 Before Hawkins Decoded Stonehenge an amateur investigator Peter Newham came to some similar conclusions about alignments. 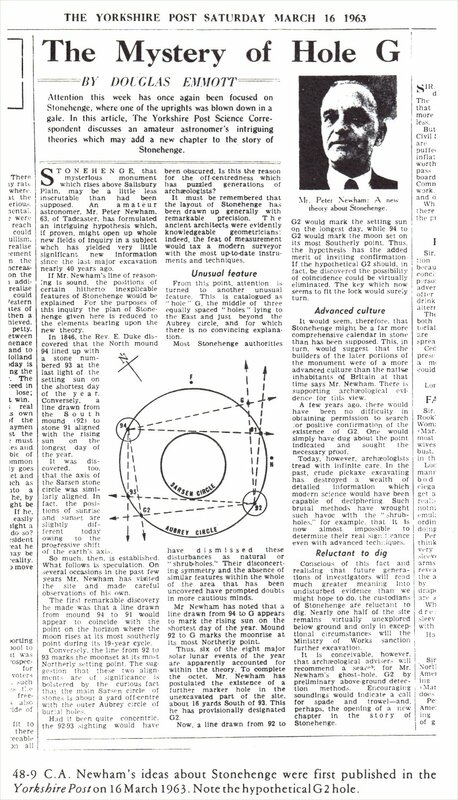 From Megaliths, Myths and Men: Introduction to Astro-archaeology by Peter Lancaster Brown (24 May 1976) - highly recommended and explains poor Peter's misfortunes as he tried to publicise his findings. 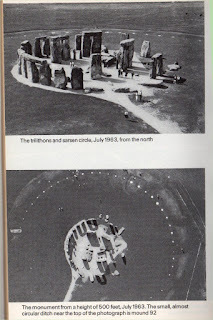 He did eventually publish a book The enigma of Stonehenge and its astronomical & geometrical significance which can be found on eBay for a couple of quid usually. 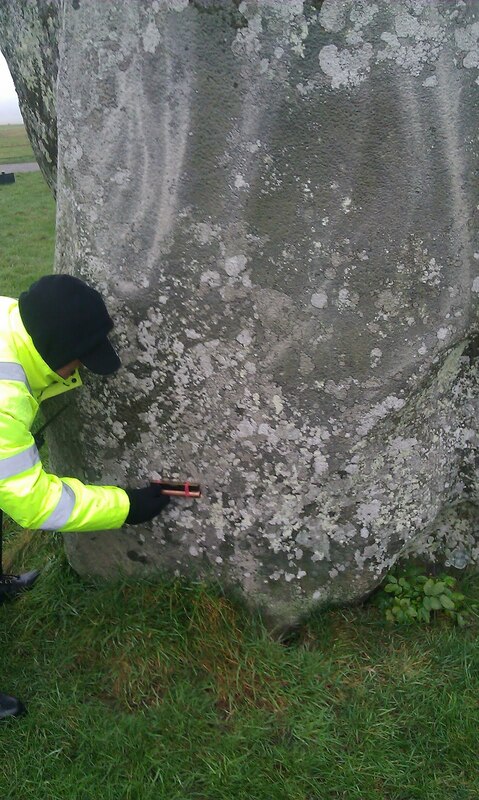 Help required - My much appreciated couple of long suffering readers here will know I have been banging on about how I think that the orientation of the Great Trilithon aligns to the Winter Solstice Sunrise. I have tried to distil my thoughts into a short document, leaving the detailed research for another day. 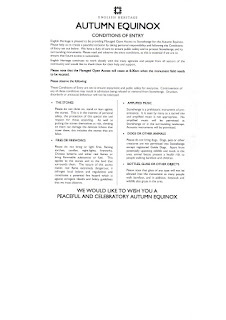 Your comments on this linked document would be very welcome. It is publicly shareable, so please pass it on if desired. Thanks. 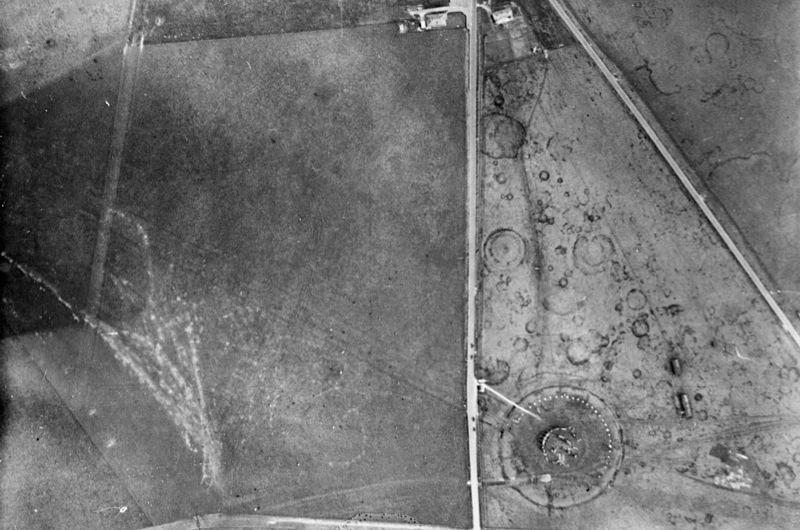 Station stone 93 (the one nearest the public hard path) in an aerial photo taken in 1906 by a Lieutenant Philip Henry Sharpe from the Royal Engineers Balloon Section. The square is a fence erected to protect it, but what is the ring? Here is the complete picture this is clipped from. 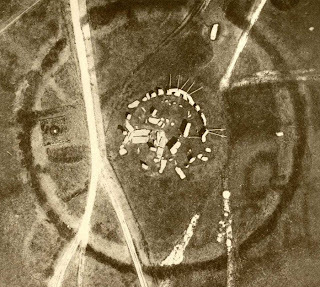 In aerial photos of Stonehenge there are many rings to be seen, they are mainly Fairy Rings which are natural fungal phenomena. "Chalky soils on higher elevations in the counties of Wiltshire and Dorset (U.K.) used to support many meadow-type fairy rings. Rabbits crop grass very short in open areas and produce nitrogen-rich droppings. Mushrooms need more soil nitrogen than grass does. A ring can start from a single spore from which the mycelium develops; the fruiting bodies of the mushrooms only appearing later, when sufficient mycelial mass has been generated to support them. Subsequent generations of fungi grow only outwards, because the parent generations have depleted their local nitrogen levels. Meanwhile, rabbits keep cropping the grass, but do not eat the fungi, allowing them to grow through their competition to tower, relatively, above the grass. " A later aerial photograph of the Stonehenge Triangle shows many of them. But is the ring around 93 a Fairy Ring? With a stone in the middle it cannot have grown evenly from a single spore, and if it had grown around the stone from one side it would not be so symmetrical. 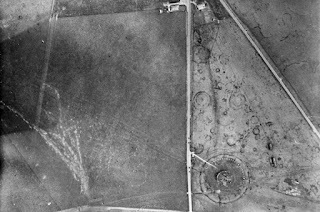 In the larger scale photo above from the 1930s I can almost imagine it is still visible but a search of more recent images, including the resistivity survey fails to show it up again. (As always click on any image to enlarge it). 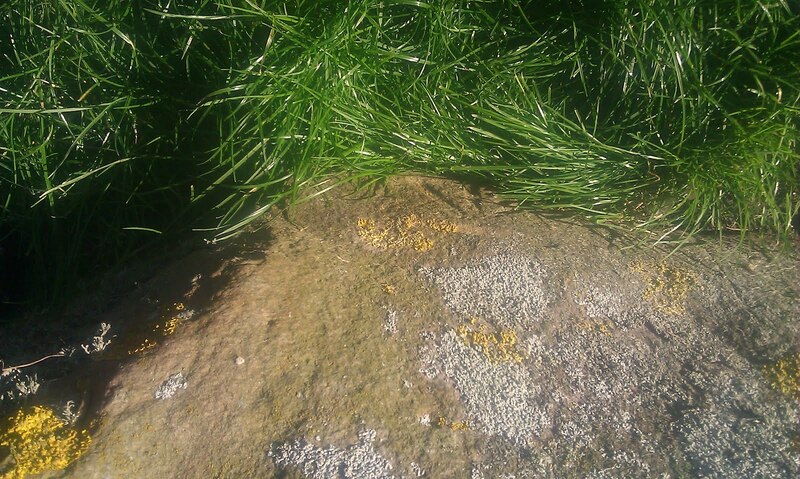 It might just have been where sheep had walked round the stone rubbing on it or is a smaller dug ring such as Station Stone 94 (missing) had with the North Barrow? 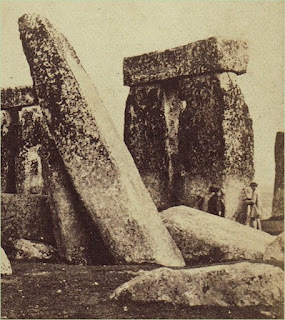 And on looking at the 1930s photo there is another strange mark by the large barrow to the east (towards the top) of Stonehenge. The barrow is to the left and to the right there is a horseshoe shape. A strange fairy ring, or a cropmark of a henge? Again nothing seems to show up in more recent photos or surveys. I think it is probably a Fairy Ring. When they get large concentric rings can form: By the time a circle of mushrooms reaches about 6 metres (20 ft) in diameter, rabbit droppings have replenished the nitrogen levels near the centre of the circle, and a secondary ring may start to grow inside the first. 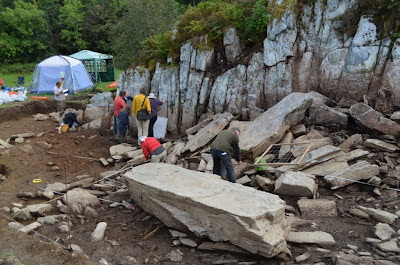 The 2011 dig -- showing the big stone which has caused more excitement than is really justified, and the litter of smaller broken stones banked up against the rock face. A photo taken by Linda Norris, showing how much bigger the 2012 dig is, and showing the great bank of rubble and slabs between the big stone and the rock face. 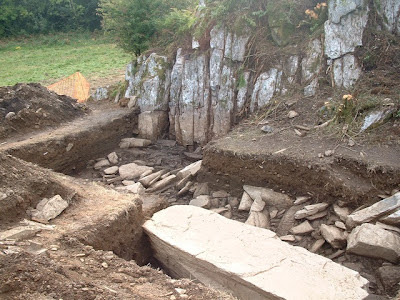 Follow the link for Brian's detailed and fair report on Mike Parker Pearson and Colin Richard's excavation looking for a Stonehenge Bluestone Quarry. 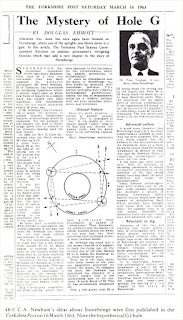 Click picture for larger image or title link above to calculate it yourself. 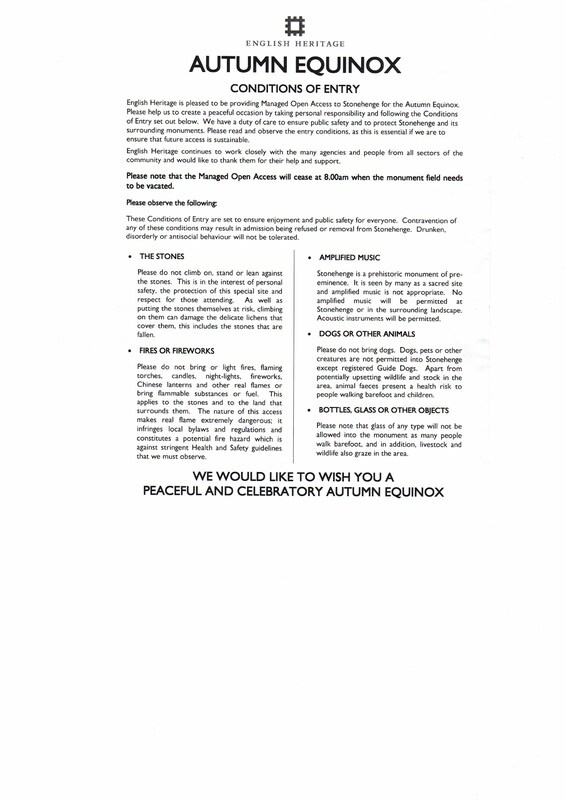 English Heritage will be allowing free access after 6:00 am with exit required at 8:00 am. It is a small gathering, let's not spoil it. 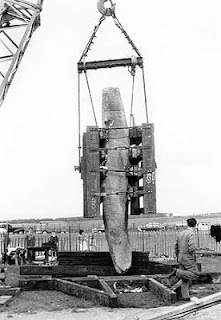 With the building work at Airman's Cross well under way I thought a link to what is planned might be useful. 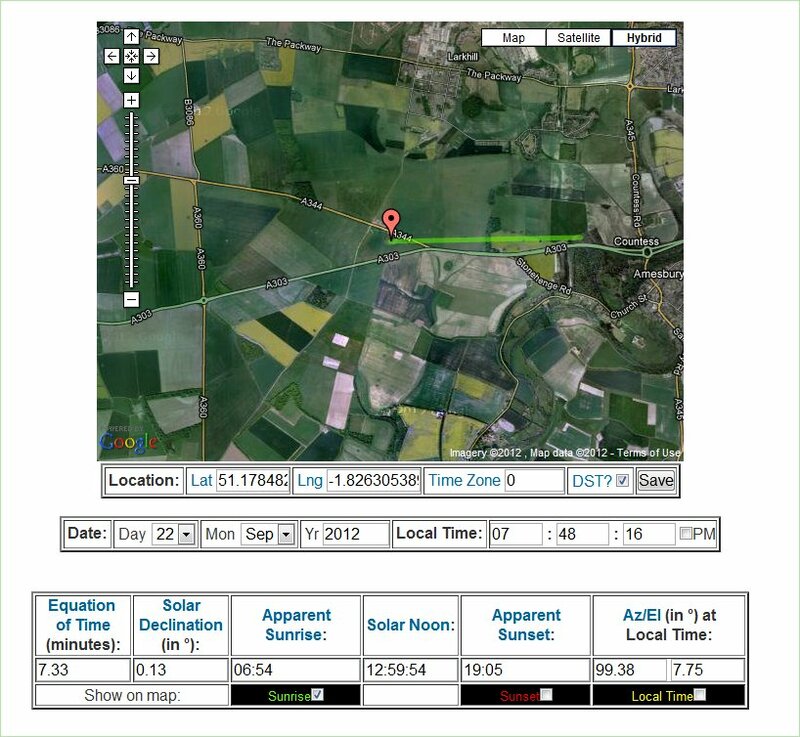 Large architect visualisations are here. The planning documentation is also available at this link. And a brief overview is copied below. 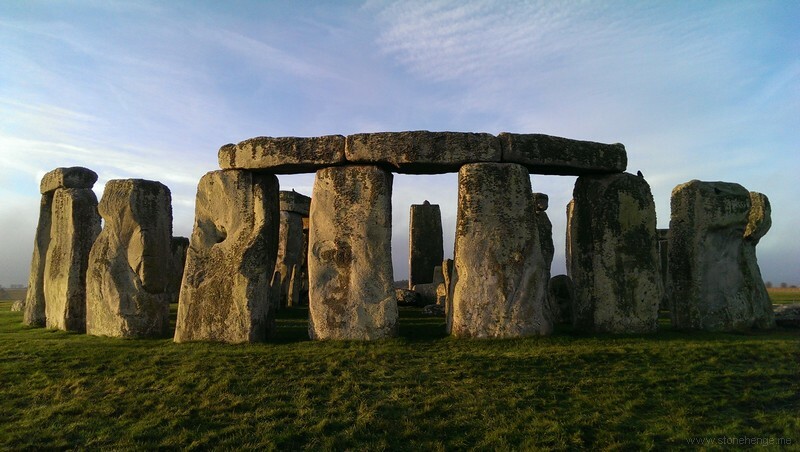 Architect Denton Corker Marshall is working on a new visitors’ centre for Stonehenge as part of a £27 million English Heritage project. The project sees Denton Corker Marshall design all interiors and exteriors for the centre, while Haley Sharpe Design is working on interpretation design for the exhibition space. The single-storey building will use one glass pod and one timber pod, which will be joined by an undulating canopy form designed to reflect the Salisbury Plain. The pods will house an exhibition and museum space, shop and café. The metal roof is perforated and supported by randomly arranged slender columns, aiming to create a ‘transitory and temporary sense to the centre’, according to the architect. Pareidolia ( /pærɨˈdoʊliə/ parr-i-doh-lee-ə) is a psychological phenomenon involving a vague and random stimulus (often an image or sound) being perceived as significant. Common examples include seeing images of animals or faces in clouds, the man in the moon or the Moon rabbit, and hearing hidden messages on records when played in reverse. The word comes from the Greek words para (παρά, "beside, alongside, instead") in this context meaning something faulty, wrong, instead of; and the noun eidōlon (εἴδωλον "image, form, shape") the diminutive of eidos. Pareidolia is a type of apophenia. In his notebooks, Leonardo da Vinci wrote of pareidolia as a device for painters, writing "if you look at any walls spotted with various stains or with a mixture of different kinds of stones, if you are about to invent some scene you will be able to see in it a resemblance to various different landscapes adorned with mountains, rivers, rocks, trees, plains, wide valleys, and various groups of hills. You will also be able to see divers combats and figures in quick movement, and strange expressions of faces, and outlandish costumes, and an infinite number of things which you can then reduce into separate and well conceived forms." A drawing which, despite not bearing much resemblance to a real face, most people will identify as a picture of one. Carl Sagan hypothesized that as a survival technique, human beings are "hard-wired" from birth to identify the human face. This allows people to use only minimal details to recognize faces from a distance and in poor visibility but can also lead them to interpret random images or patterns of light and shade as being faces. The evolutionary advantages of being able to identify friend from foe with split-second accuracy are numerous; prehistoric (and even modern) men and women who accidentally identify an enemy as a friend could face deadly consequences for this mistake. This is only one among many evolutionary pressures responsible for the development of the facial recognition capability of modern humans. In Cosmos: A Personal Voyage Sagan claimed that Heikegani crabs' occasional resemblance to Samurai resulted in their being spared from capture and thus exaggerate the trait in their offspring, a hypothesis proposed by Julian Huxley in 1952. Such claims have been met with skepticism. A 2009 magnetoencephalography study found that objects incidentally perceived as faces evoke an early (165 ms) activation in the ventral fusiform cortex, at a time and location similar to that evoked by faces, whereas other common objects do not evoke such activation. This activation is similar to a slightly earlier peak at 130 ms seen for images of real faces. The authors suggest that face perception evoked by face-like objects is a relatively early process, and not a late cognitive reinterpretation phenomenon. AnfMRI study in 2011 similarly showed that repeated presentation of novel visual shapes that were interpreted as meaningful led to decreased fMRI responses for real objects. These result indicate that interpretation of ambiguous stimuli depends on similar processes as those elicited for known objects. These studies help to explain why people identify a few circles and a line as a "face" so quickly and without hesitation. Cognitive processes are activated by the "face-like" object, which alert the observer to both the emotional state and identity of the subject – even before the conscious mind begins to process – or even receive – the information. The "stick figure face," despite its simplicity, conveys mood information (in this case, disappointment or mild unhappiness). It would be just as simple to draw a stick figure face that would be perceived (by most people) as hostile and aggressive. This robust and subtle capability is the result of eons of natural selection favoring people most able to quickly identify the mental state, for example, of threatening people, thus providing the individual an opportunity to flee or attack preemptively. In other words, processing this information subcortically (and therefore subconsciously) – before it is passed on to the rest of the brain for detailed processing – accelerates judgment and decision making when alacrity is paramount. This ability, though highly specialized for the processing and recognition of human emotions, also functions to determine the demeanor of wildlife. Combined with Apophenia (seeing patterns in randomness) and hierophany (a manifestation of the sacred), pareidolia may have helped early societies organize chaos and make the world intelligible. There are three Ordnance Survey Benchmarks on the sarsens of Stonehenge - two are on the road side of the Heel Stone on the righthand side as seen through the fence - one is 70cm from the ground and the other 20cm - both are quite easily seen if the light is right. 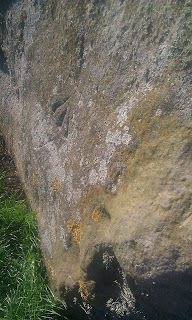 The other is 80cm up on the south side of Stone 16 - the pointy one on the opposite side of the ring to the Heel Stone - It is only visible with difficulty and not from the public path. 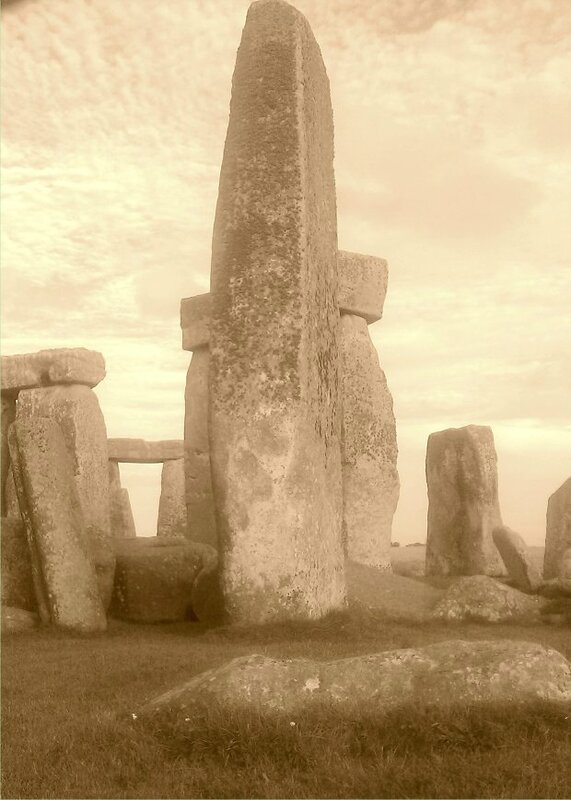 Stonehenge - The Shepherd's Temple? This paper rewrites the early history of Britain, showing that while the cultivation of cereals arrived there in about 4000 cal BC, it did not last. Between 3300 and 1500 BC Britons became largely pastoral, reverting only with a major upsurge of agricultural activity in the Middle Bronze Age. This loss of interest in arable farming was accompanied by a decline in population, seen by the authors as having a climatic impetus. But they also point to this period as the time of construction of the great megalithic monuments, including Stonehenge. We are left wondering whether pastoralism was all that bad, and whether it was one intrusion after another that set the agenda on the island. 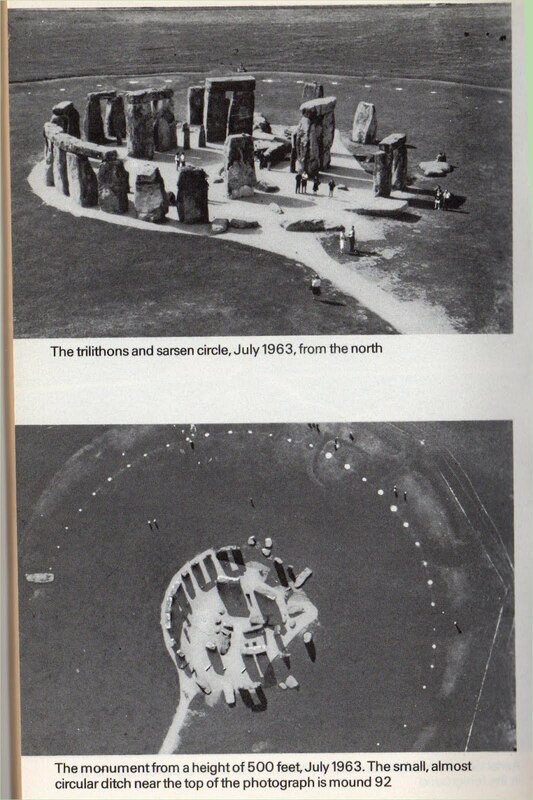 From an old edition of Stonehenge Decoded by Gerald Hawkins. Note Stone 23 which fell over in March 1963 and was re-erected in 1964. 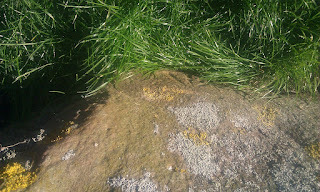 I wonder if the smooth, lichen free surface of it is from the cradle. I couldn't quite get the exact photo as it was a very quick snapped shot and I think the 1880 shot was taken with a camera sitting on Stone 19, which I, of course, couldn't replicate. But I think it shows how 56 was pivoted on its underground end when it was straightened. 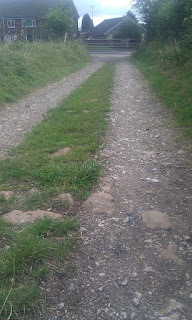 North of the A303 there is a track that follows the disused railway to Larkhill. Where it leaves the main road Sarsen stones have been used as part of the stone mix. The photo shows them as the large reddish stones proud of the gravel. 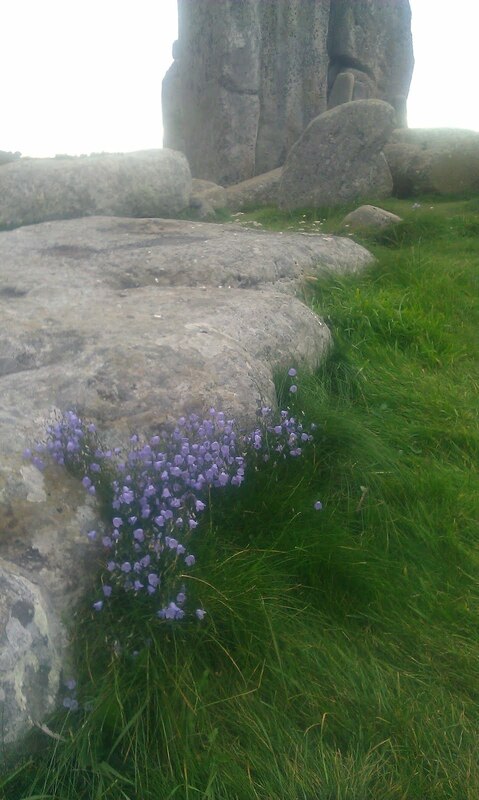 The colour and shape of them makes it clear they are small natural stones and not smashed up bits of the missing grey stones of Stonehenge.